SkinnySki.com has complete and up-to-date collection of trails. We recommend reviewing their website – in particular the South West WI map and South East WI map. 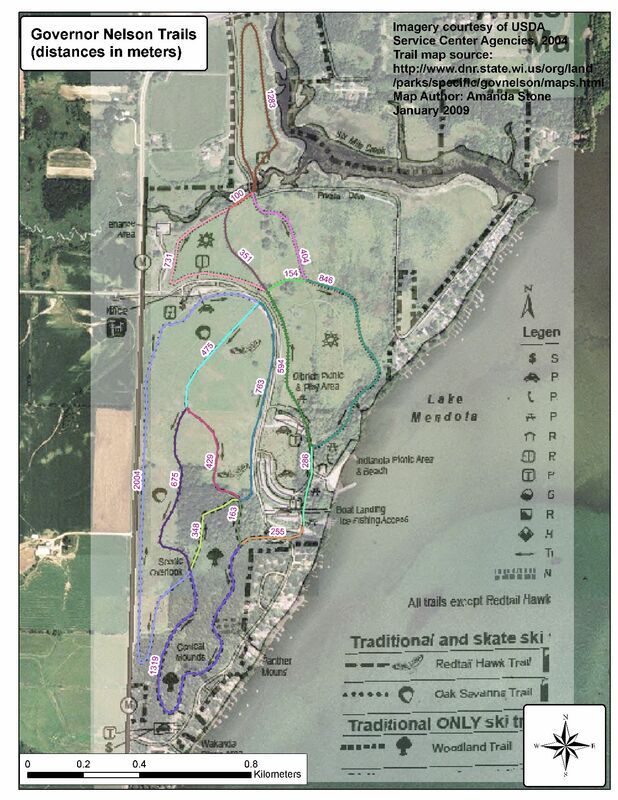 Close to home, check-out the City of Madison Cross Country Ski page. Check grooming status and buy your annual pass online (for Elver and Odana). SkinnySki.com is not associated with Madnorski. For local and regional trail conditions we recommend using our Madnorski website. Following is a collection of information about area trails that may not be represented on SkinnySki.com. 3.1 miles, classic only, easy and intermediate. No trail fee. North side, 5002 School Rd. 1 mile, classic only, intermediate. No trail fee. Far east side, 7035 Littlemore Dr.
6.2 miles, classic and skate, all skill levels. City/county trail fee. Warming shelter, lighted loop. Southwest side, 1250 McKenna Blvd. Home to Madnorski Tuesday Night Races. Conditions typically very good despite heavy use. 5.3 miles, classic and skate, easy. City/county trail fee. Restrooms. Southeast side, on Lake Waubesa, 3113 Lake Farm Road. 3.5 miles, classic and skate, easy. City/county trail fee. Shelter, rental (weekends), restrooms. Call the Odana Club House at 266-4724 to check on the availability of ski rentals. West side, 4635 Odana Rd. 1.5 miles, classic only, intermediate. No trail fee. West side, 6021 Old Sauk Rd. 3.1 miles, classic only, easy and intermediate. No trail fee. Restrooms. Near southwest side, 1156 Olin Turville Ct. Sheltered from wind and lots of ambient city light for night skiing. 10.5 miles, classic and skate, all skill levels. Trail fee. Clubhouse with food. Far southwest side, 9002 County Rd PD. 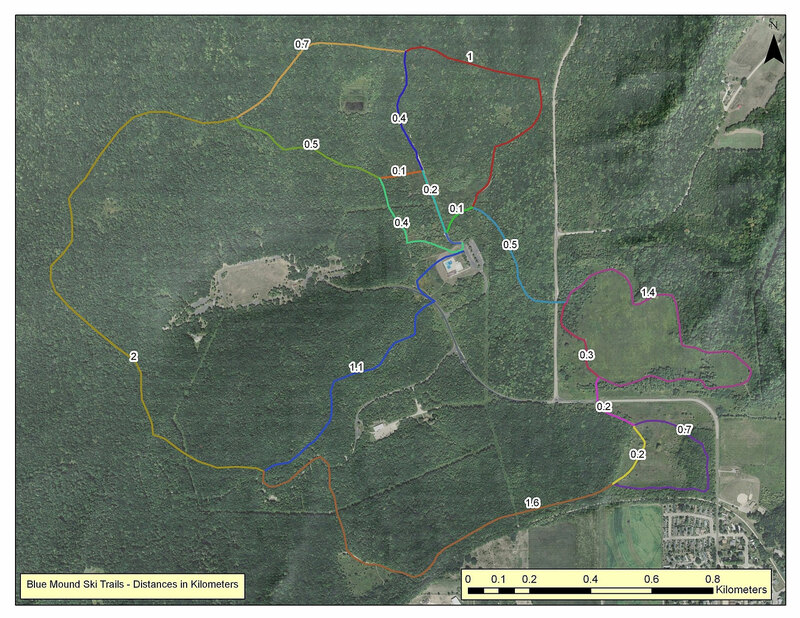 Extensive trail system on 1200-acre property, ungroomed, hiking and snowshoeing also allowed. No trail fee. Please stay on trails marked for skiers. Near southwest side, Arboretum Dr.
4.1 miles, classic and skate, easy and intermediate. City/county trail fee. Far east side, 6701 Hwy 12 & 18 East. Private club with classic and skate trails, ski jumps, downhill runs, and snowmaking. West of Madison, 10118 and 10222 Blackhawk Rd., Middleton. 5.2 miles, classic and skate, easy and intermediate. State Park entry fee. Restrooms. The multiuse trail allows snowshoes and leashed pets, including skijoring. On the north shore of Lake Mendota on county M west of Hwy 113. Address for navigating is 5140 Co Hwy M, Waunakee. 8 miles, all skill levels. No trail fee. Excellent grooming. Portable toilet on site. West of Madison, 1322 N Pleasant View Rd, Middleton. 4 miles, classic and skate, easy. City/county trail fee. Portable toilet on site. North of Madison on Hwy 51. Address for navigating is 6200 US-51, DeForest. 5 miles, classic and skate, all skill levels. City/county trail fee. Shelter, restrooms. Southeast of Madison, 68 County Highway B, Cambridge. 17 miles, classic and skate, all skill levels. State Park entry fee. Warming house, restrooms, lighted loop. W329 N846 Co. C, Delafield. 24 miles, classic and skate, all skill levels. State trail pass required. The park periodically grooms the Steinke Basin loop (2.5 miles, easy) for classic and the Johnson Moraine (2.8 miles, easy) for skate. Confirm trail conditions with park staff. State Park entry fee. In the Baraboo Hills. Trailheads are on HWY DL. 12.4 miles, classic and skate, all skill levels. Trail fee. Chalet and rentals (weekends). E398 County Rd MM, Iola. 3.8 miles, easy and intermediate. They try to groom 3-4 days a week and before all ski team practices. Lakeland Hills Country Golf Course, 300 Prospect Ave, Lodi. 10 miles, classic and skate, all skill levels. Trail fee. Lodge, refreshments, rentals, cabins. 17.6 miles, classic and skate, all skill levels. Requires both a State Park entry fee and state trail pass (16 and older). Restrooms. Address for navigating is E10320 Fern Dell Road, Baraboo. 18.3 miles, classic and skate, all skill levels. Trail fee. Chalet, restrooms, rentals. 6.2 miles, classic only. No trail fee. 9.3 miles, classic and skate, all skill levels. Trail fee. Ski lodge. 5 miles, easy and intermediate, classic and skate. State Park entry fee. Restrooms. Southeast of Madison, 2405 Door Creek Rd, Stoughton. 3.1 miles, volunteer groomed. No trail fee. 2801 Rockport Rd, Janesville. 11 miles, ungroomed, all skill levels. No trail fee. A former private ski area, now publicly owned. Hikers and snowshoers allowed on trails. Blackhawk Ridge Unit of the Wisconsin State Riverway, 6950 WI-78, Mazomanie. 15 miles, all skill levels, most trails are groomed for classic when conditions permit. Requires both a State Park entry fee and a state trail pass (16 and older). Check first to find how this venue is groomed. Restrooms, warming shelter. Address for navigating is Mounds Rd, Barneveld. 12.5 miles, classic only, intermediate and advanced. State Park entry fee. Restrooms. 4175 WI-23, Dodgeville. No longer groomed. Only resort guests are allowed to ski on the trails. 9 miles, classic only, intermediate and advanced. City/county trail fee. Restrooms. Northwest of Madison on HWY 19, three miles west of HWY 12. Address for navigating is 8183 Hwy 19, Cross Plains. 5 miles, ungroomed, challenging hills. No trail fee. Restrooms. Hikers and snowshoers allowed on trails. 3106 Cty Hwy JG, Mount Horeb.